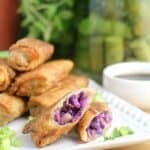 Crispy spring rolls filled with the most DELICIOUS red cabbage, mushroom, and radish filling you could ever hope for in your life. Heat the oil in a large skillet. Add the mushrooms and saute until browned. Add the cabbage and saute until just slightly softened and fragrant (just a minute or two). Add the ginger, garlic, honey, mirin, vinger, sesame oil, radish, and green onion. Saute until most of the liquid is evaporated. Remove from the heat. Heat a large rimmed pan with ~1/2-inch of canola oil. Working in batches, add spring rolls and fry, turning once, until nicely golden. Transfer to a plate with lined with paper towels. In a small bowl, combine the ingredients for the dipping sauce. Serve with the spring rolls! Yields: ~21 servings (how many wrappers were in the package I had).